These stylish and very comfortable baby carriers are suitable from birth to 12 months (3.5kg to 9kg). It’s the ideal way to develop a close bond between parent and baby with the comfort and reassurance of your heart beat. 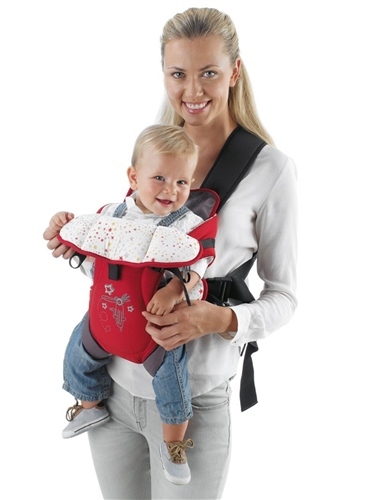 This baby carrier has the advantage of being able to accommodate your baby in 1 or 3 positions; either facing inwards or outwards on the front or as a back carrier. Suitable from birth to 12 months approx, 3.5 - 9 kg. Includes a baby bib that also helps to protect your clothes against their dribbles. Cross over back lumbar support for parent that distributes the baby’s weight evenly across your back for added comfort. Padding to hold and support your baby’s back in place. Upper, wider 4 cm, luxuriously padded straps that relieve shoulder strain and give optimal comfort and support. Bought this carrier after extensive research and I was at first after a carrier in the £100 budget bracket but after careful consideration i decided to purchase this one. ~Only as im not going to use it so much but am buying it to use for our holiday and flight. My baby boy is also 5 months old now and hes a BIG boy 8.8kg so I thought not worth spending loads of money as he will grow out of it soon anyways. So I was very much pleasantly surprised with the carrier as I thought it wasn't going to be good or that i would be returning it as my heavy little wopper wouldnt fit in it or that it would kill my back......none of the above!! Its actually very sturdy and well padded. The straps are really super comfy both for me and baby and after a whole day of "testdriving" today i must say Im really happy with it! And he fits in it both ways of carrying as well, just thought id mention that. Also really easy to put on and put baby in on your own. You defo dont need another person. Does look exactly as on pictures and is actually even nicer in real life. Would recommend to anyone! Its a great carrier for the price!!!! WANTED TO ADD AFTER A MONTHS USAGE: really super good ...im STILL really happy with this as i was intending to spend alot more initially...my baby loves it and i love it!! Verified Purchase. very high quality item, proved very useful when travelling through airport. Although my wife was still required to take it off for it to be searched.